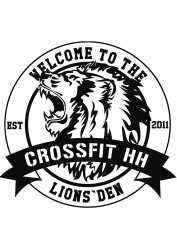 CrossFit HH is Hamburg’s first and largest CrossFit affiliate box. We are a place where people willing to put in a bit of effort and hard work can see dramatic changes in their fitness, health and well being. CrossFit HH is a warm and welcoming community of like-minded individuals striving to improve our cardiovascular endurance, stamina, strength, flexibility, power, speed, coordination, accuracy, agility and balance while having a ton of fun in the process. Our workouts involve running, rowing, biking, swimming, skipping, jumping, throwing, swinging, lifting, squatting, pressing, pushing, pulling and climbing. The workouts are individually tailored so that they can be done by everyone at any ability or skill level, from grandmothers to police officers to football players. All our coaches and almost all members speak english, too. Come in and join! Crossfit HH from Rhys Morgan on Vimeo.